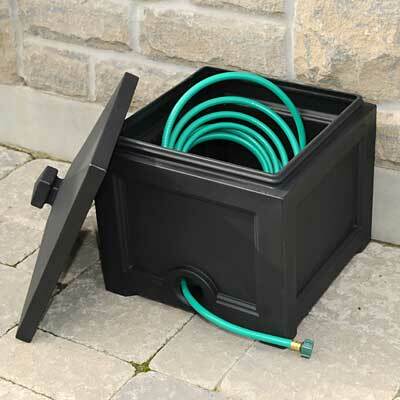 Keep your watering equipment neat and organized using the Mayne Fairfield Garden Hose Bin. Placing your garden hose in a vessel helps it stay nicely coiled, preventing kinks for ease of use. This beautiful bin not only brings style to your garden, it also perfectly contains up to 100' of garden hose. The square shape adds a formal hint to the piece, furthered by its black color and pyramid-inspired lid. A slightly inset panel detail on each side of the unit lends more design, and the small legs keep the holder elevated off the ground. A 2" hole on the back of the piece accommodates one end of your garden hose, so it may remain attached to your spigot. The snap fit lid protects your hose from the elements, and its top handle makes it easy to remove when needed. The polyethylene body withstands harsh weather, remaining beautiful for a lasting receptacle. Place your garden hose in a remarkable vessel using this Fairfield Garden Hose Bin. Made in the USA. Fifteen year limited warranty.